The sign said EXPRESS CHECKOUT 15 ITEMS OR LESS. The person in front of me had 20, I counted. I was obeying the rules, I only had 6. It wasn’t fair, who did she think she was? I had things to get done! I felt minimized and unimportant as she took the extra time to unload her cart. I did not say a word as I stuffed my irritation and continued to hold a wavering smile. I was aware my thoughts were becoming progressively negative, the more my heart increased and my body tensed. I realized that all my stewing and stuffing was not going to change my situation. My choice to respond with tense inward irritation was not productive, it was life draining. I was allowing my life light to be dimmed by my thoughts and choices. I needed to change my focus. I was loosing sight of the light of God’s love in me. I could have shame myself for messing up AGAIN. Which only would have create struggle and shame. What I needed to do was SHIFT instead of SHAME. To shift my focus from my automatic, habitual was of responding, to the presence of God’s Spirit within me. Shifting from painful shame to the peaceful truth of God’s love. Peter is encouraging these suffering, persecuted children of God, to be loving. He empowered them by explaining how they can love in such difficult times. He reminding them of their connection to God, their reality based on the truth of God’s word. Your old birth came from mortal sperm; your new birth comes from God’s living Word. Just think: a life conceived by God himself! Believe in the redemptive love of God v21. (Colossians 1:13-14) Believing, trusting and relying on the constant reality of God’s saving love will change everything! If He has delivered us from the “domain of darkness and transferred us to the kingdom of his beloved Son” (ESV) we no longer have to be stuck in our unloving, judgmental, attitudes. These attitudes increase stress and create limitations. We are connected to His Spirit which means we are empowered and enlarged to look at life through the lens of loved child of the creator. Focus on the true hope found in the love of God v21 . (IJohn 3:2-3) What we believe turns the direction of our heart focus. The heart if often described as the center of our being. If our belief turns our heart to be “centered and rest” on a confident hope in God, we are accepting a truth that has a healing impact on our soul. A soul focused on God will find peace and serenity in this broken world. Change into a pure hearted child of God v22. (Colossians 3: 10-12) As we embrace our transfer to the kingdom of Christ we see ourselves as a loved child. This transfer renews our hearts! As our identity changes we no longer base our value and acceptance on the response of others. We have a new identity, a new heart that is resting in God. When we believe, focus and change through the truth of renewed heart our brains are being reprogramed. Love from the grace connection of God v23. (John 16:13) Our renewed heart is powered by the Spirit of God. When the truth of God’s love for us is realized and our actions flow from that truth. Then God’s love is being expressed in His creation. Our decision to love can draw others to His love. Every step leads us deeper into a relationship with God. We can choose to believe in, focus on, change into and love from the presence of God’s spirit in us. He gives us that choice, he never leaves, but we can choose another direction. His Truth is a reality that is life giving to our souls. I am not minimized or unimportant as His child. His Truth must be realized to change my heart. Truth, in the embodiment of Jesus Christ, is God’s nature expressed to us. His nature is expressed through his creation as we change and love. Realizing God’s truth as a reality for your soul reveals love’s reality for your life. Each time we choose to act, we should ask ourselves, “what is the most loving thing I can do?” A loving action will benefit others, it benefits us as well. Practicing love is a process of progress. In the check out line I might have counted her items and then chosen to let it go, accept that I cannot change her actions but I can control my choices. I can refocus my brain to the new reality of my heart, I am loved and seen by God. Acceptance is progress in living with a heart of love. The next step, as I mature in the process, would be to realize that what others choose to do is more about them. Then I would not even find it necessary to count any items. I will have a serene, peaceful heart that habitually focuses on my reality with God and with a grateful heart I will be open and engaging. SO…the next time I am in a check out line, I will choose not to even count the items. I will kindly engage with the person or I will keep my heart open to God’s leading. I will stay engaged with the moment choosing a more positive mindset. I will feel less stressed freeing my heart to be open in the moment rather than to stuff. A heart open to God’s light, reveal’s His love to the world. Listen to Brandon Heath’s song, The Light in Me, and be inspired to shine His light in love. 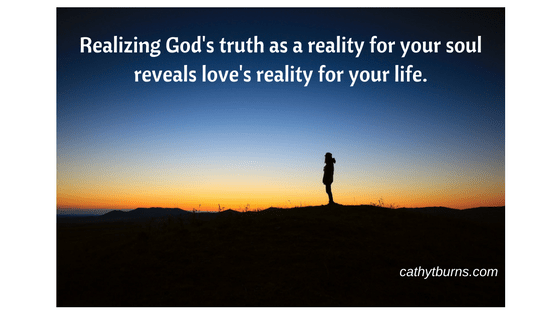 Loved and needed this, Cathy!